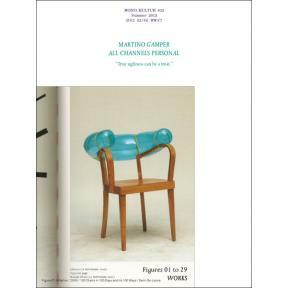 Martino Gamper is the kind of product designer we all have been waiting for: Brimming with ideas, energy and humour, his designs are disarmingly irreverent and irresistibly fun, and unlike anything one will see in the puristic galleries of contemporary design. Crossing over from studying sculpture to completing an MA in product design at the prestigious Royal College of Art under Ron Arad, Gamper has had little time to worry over the theoretical do’s and don’t’s of his profession – instead, he has followed a simple rule of learning by doing, meaning: the more you do, the more you learn. If anything, his work is driven by an insatiable curiosity and openness, which is also expressed by the frequent collaborations with friends from different fields. Martino Gamper treats his work as a means of communication and interaction, by frequently inviting visitors and passers-by on the street to join and engage, or by creating not only the furniture, but also improvising the 7 course-menus for his legendary Trattoria pop-up dinner evenings – elevating, as an inevitable and highly welcome side effect, design into a profoundly social activity. Visually, the issue is bursting with references and ideas, reclaiming image material from left and right, while unveiling the structure of a book with three booklets of different sizes all lovingly assembled into one – and manually at that, which makes for some rough edges or rather what we like to call extra personality.